Welcome to Tutorial Tuesday! Maybe this will become a regular feature here at New Zealand Handmade? But maybe not, it's too soon to tell. 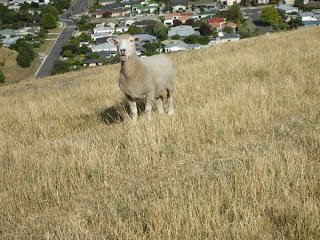 We all know that internationally New Zealand has a reputation for being very sheepy. And I guess it's a deserved reputation, though the sheep:human ratio is decreasing dramatically lately, while the cow:human ratio is on the rise. That's a rant for another day, but in the meantime, we've still got sheep! 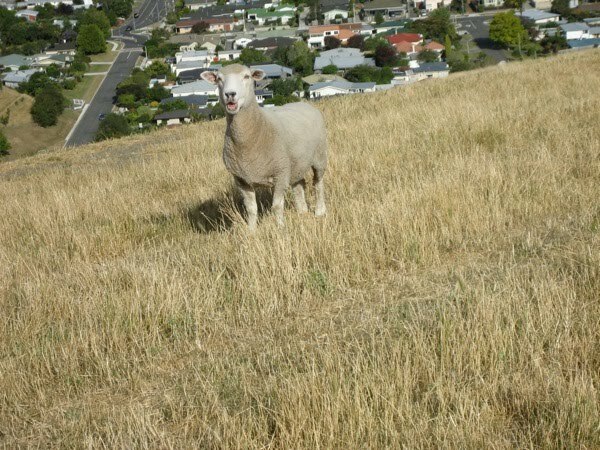 This photo was taken on the hill at the end of my nice, suburban cul-de-sac. So it's no wonder that the wool crafts have a strong history here. 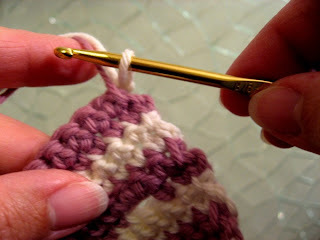 I'm usually a knitter, but lately I've been trying my hand at crochet and I've been really enjoying it. 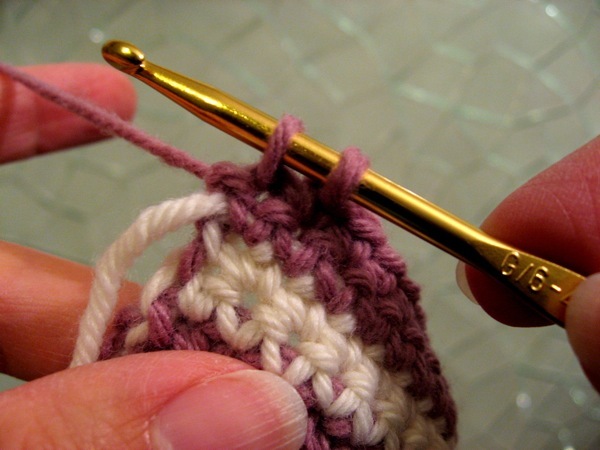 Still a total newbie, I thought I'd share a technique I discovered that is probably second nature to long-time hookers, but that I didn't find explained in any of the many crochet books I learned from. First I'll set the stage. 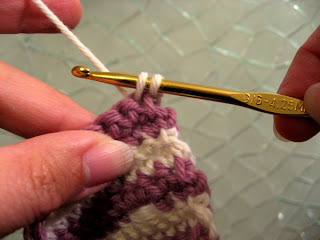 I'm making a cardigan hoodie for my soon-to-be-born niece in North America. 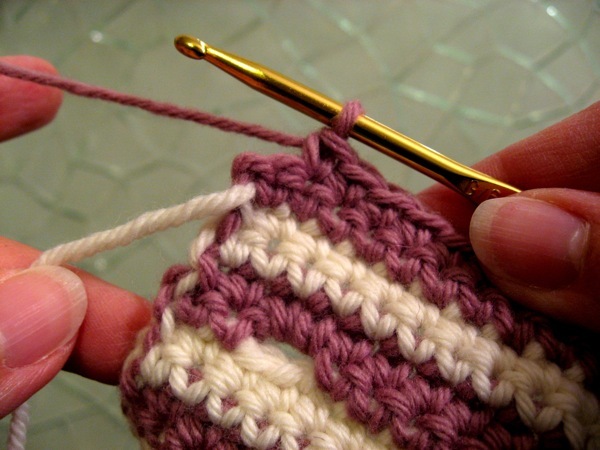 It's all in double crochet (single crochet in US terms) and it's striped in two colours (or colors in US terms). 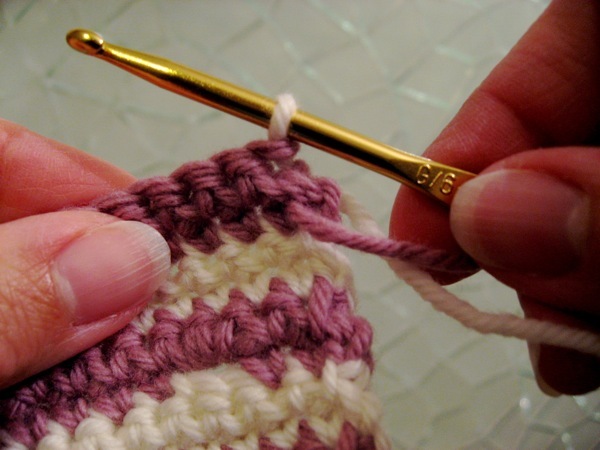 Each stripe is just 2 rows high, so according to my crochet reference books, I can just carry the yarn up the side and not worry about weaving in hundred of ends at the end. What these books don't tell me is how to carry the yarn up the side. Not horrible, but I didn't like it. 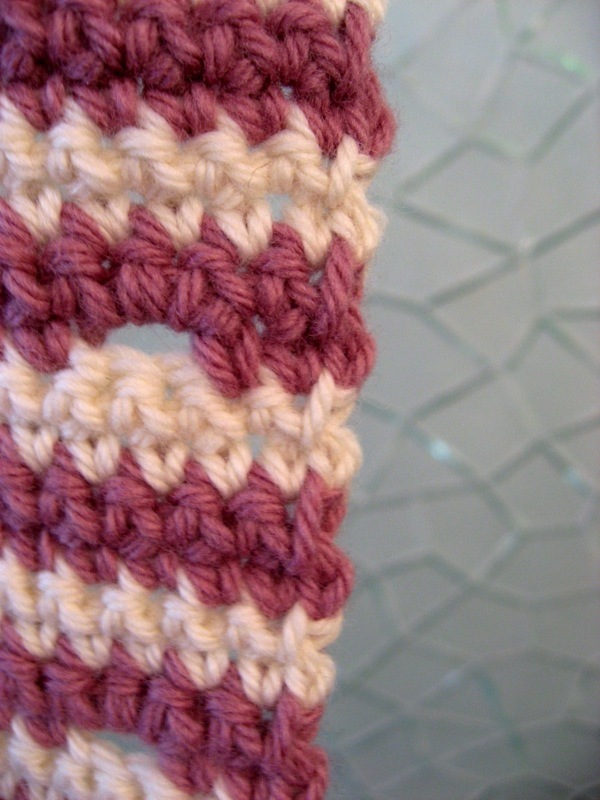 I thought it would be fine since it would be hidden in the side seam, but then I realized the right front panel would have the yarn-swap side on the buttonhole edge in the center. 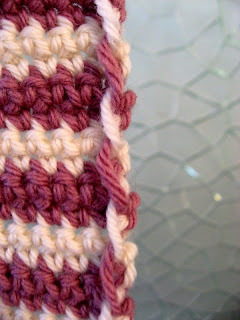 Even with a double crochet border around all the edges I thought this would be less than ideal. So I worked out this way to produce a cleaner edge while carrying yarn up the side. I'll start at the end of a stripe. 1dc before the end of a main colour (MC) row. 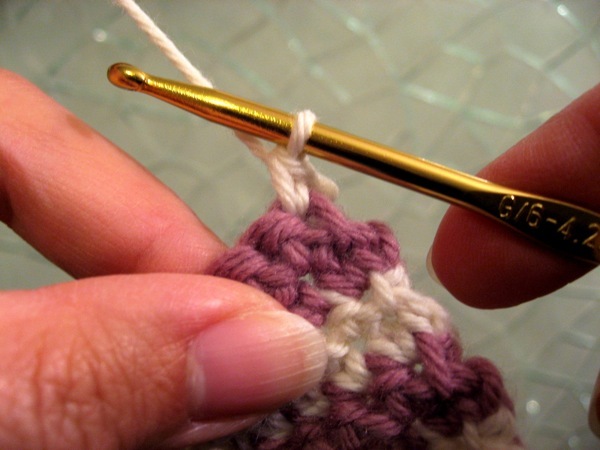 Do the first part of the dc: hook in stitch, yarn over, pull through. 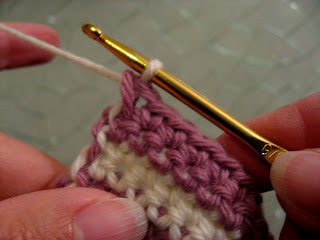 Drop the MC yarn and yarn over with the contrast colour (CC) yarn. Finish the dc by pulling the CC yarn though both loops. By switching the yarn this way, the colours stay in their correct stripes. 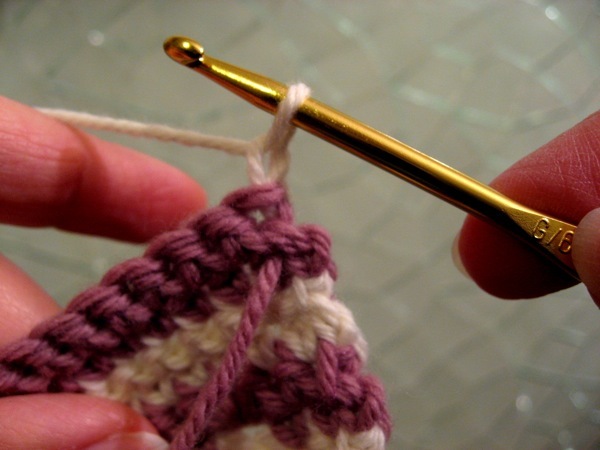 Turn your work and reposition your hook. 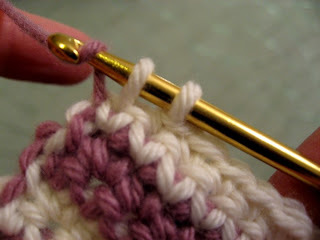 You can see the MC is sticking out towards us now, while the working CC yarn is coming out the back. Chain 1 to get to the correct height for double crochet. 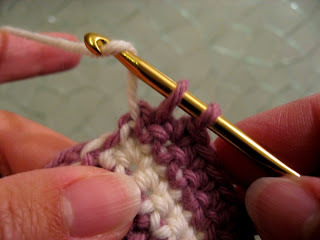 Pull the MC yarn forward snug, but not too tight. Now's the tricky part. 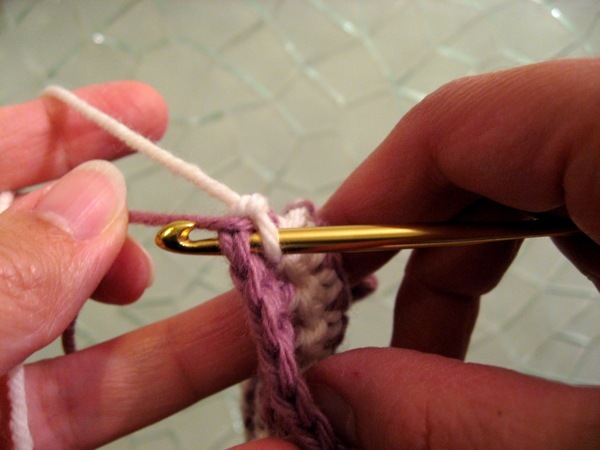 Pull the MC up and over the work, to the left of the loop on the hook, up snug to that loop. Insert your hook in the first dc, to the left of the MC yarn you've pulled back. This is the view looking down at the work. Yarn over the hook with your CC and pull through. 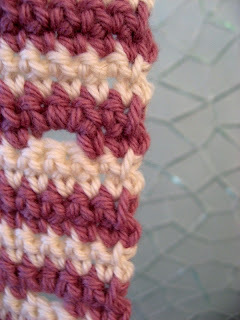 The MC yarn is now between these 2 loops going from front to back. Finish the dc: yarn over the hook, pull through both loops on hook. This is what it will look like from the back now. The MC yarn is coming out the back. 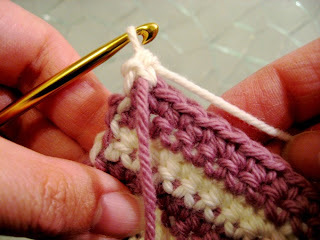 Finish the CC stripe: dc to the end, turn work, ch1, dc back as usual, to 1 dc before the end again. Now we're back to where we began, just with the colours reversed. Insert hook into the last dc, pull through a loop, then drop the CC yarn, and grab the MC yarn. 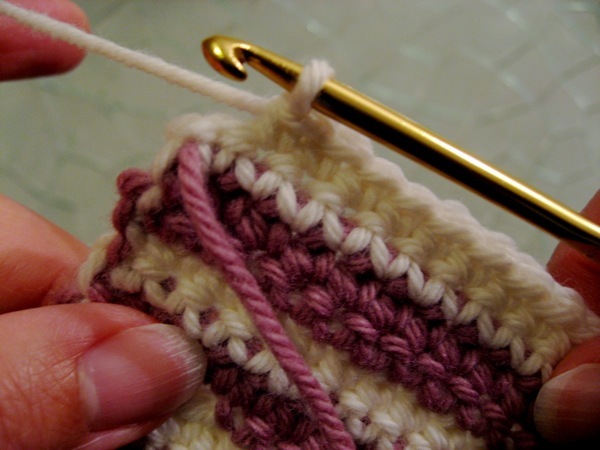 Pull through both CC loops on hook, and you've finished your stripe! Here is the finished edge! What do you think? Please leave a comment and let me know how you like this, my first ever tutorial! Well done. I will have to try this now. 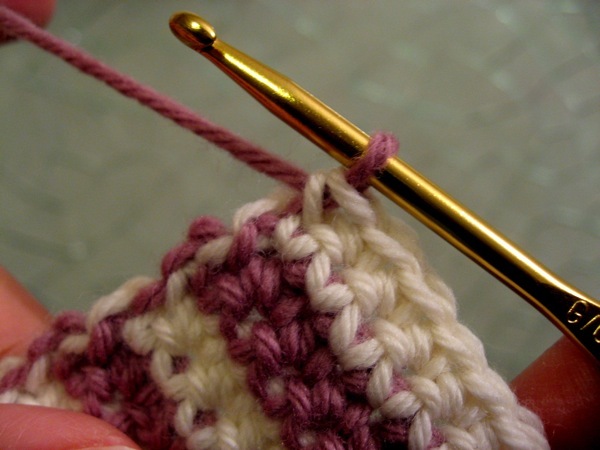 I was just going to break it off and then weave it in but will try this way now. I am going to show this to my Mum, she will be very interested. Amazing step by step instructions! Kya, even I can get this... crochet always seemed to be one of those things that "women in the know" did! Your instructions are super simple and easy. Maybe I will bring one of my attempts to meeting one day!